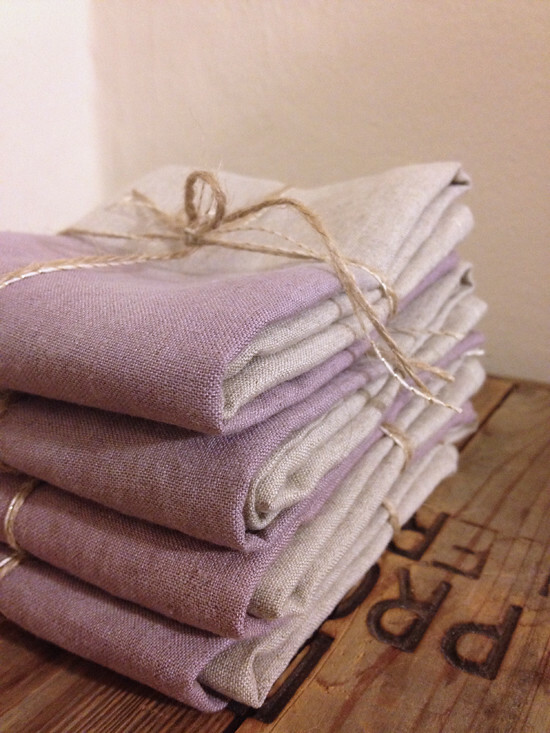 For Christmas I made a small batch of tea towels to give to friends and family. And since I'd had in my mind for a while to experiment with dying, I decided to experiment on friends and family. 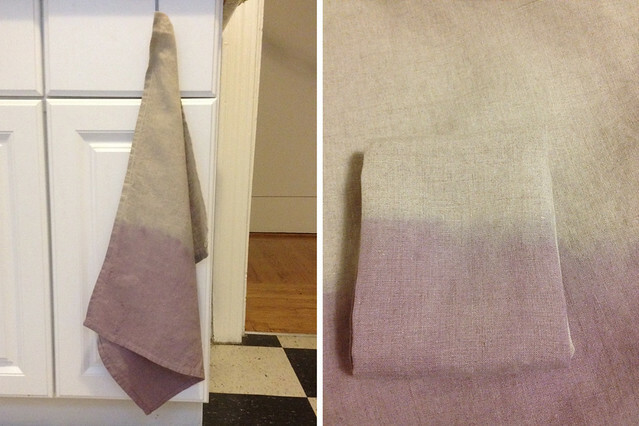 After the jump you'll find the basic steps for creating a tea towel and what I did to create a gradient on the towels from blueberries and blackberries. your yardage will depend on how many you want to make. i created 8 from 2 yards of linen. 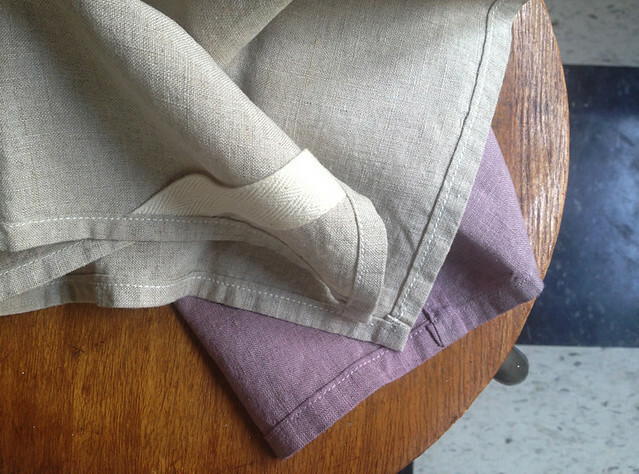 for one towel, you'll need a piece at least 24"x18.5"
The tea towels are made exactly as I made the dinner napkins in this post, with two exceptions: size and twill loop. There seems to be no standard size for tea towels, I looked. So I picked a size within the range of sizes I found online that would yield the most towels with my fabric. 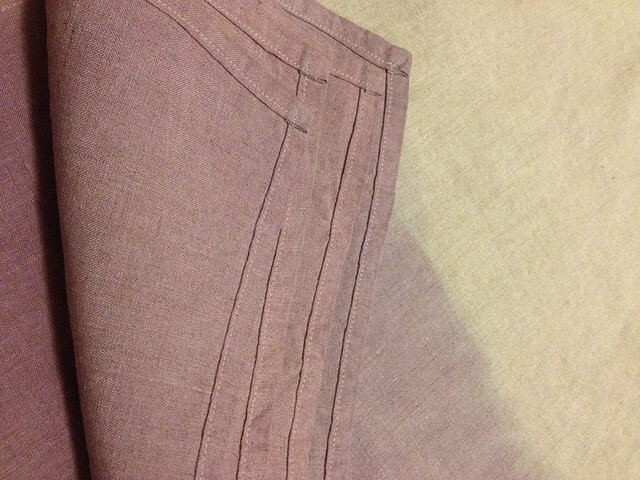 I also made a more snug hem, doing about a 1/4" on each fold (instead of 1/4" and 1/2" as the napkins are done). After you have completed folding in the side edges of each side, cut a few inches of cotton twill tape for the loop. You'll cut the ends at a slight angle so that it slips right in under your the hem, pin it in place and do your stitching around the sides. See the top photo of this post for the loop. I am by no means a dyeing professional and it will be clear I didn't even try to be. I read up a bit online, I learned about some options - and then decided on a path, trying to keep things simple. 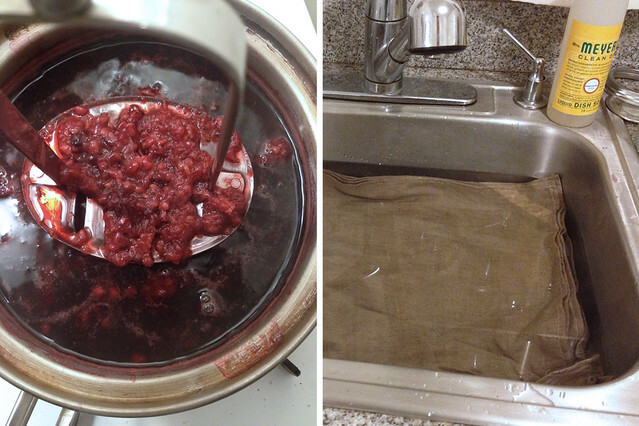 To make the dye I took blueberries, blackberries, a few pinches of salt and water to cover them an inch or so. I then let it simmer for quite a while. I'd check on it every now and then and smush things up with a masher. When things (arbitrarily to me) seemed like they'd expelled all the color they were going to expel (I don't believe it was more than an hour), I'd strain them through a mesh strainer. Keep the liquid, toss or compost the pulp. I did the two berries separately because I wanted to see the color of the dye they'd make independently (the second photo in this post shows my blackberry test strip, a much pinker hue than blueberries). I used a pint of fresh blackberries and a large bag of frozen blueberries and had a lot of dye left over. I combined the dyes I'd rendered in a large pot and put it on low heat. I put the towels in a my sink, filled with warm water and a generous splash of vinegar. And then I made the fancy set up you see on the right side of the image below. I draped the towels over a hanger (suspended from my stove's range hood with s-hooks) cliping them in place at each stage of dying. I started with the towels (about 3 at a time) nearly submerged. After about 30-40 mins I moved them a third of the way out of the liquid and in another 30 mins or so, only the bottom third in the liquid. When the towels were done I carefully transported them to the bathroom sink and let cold water run on them (in the direction of the dye, not opposite - you don't want to send dye onto the un-dyed portion) until it started to run clear. In the photo above and right you can see that there is a blueish band at the top - this is a blueberry thing, someone who understands chemistry better may be able to explain it. It mostly faded away after drying. After they were all dyed, I put them in the dyer to set the color. The color faded a bit, but not too much. And finally, tied with bows for giving. I liked that this was a pretty simple project - I want to experiment with other things in the kitchen I can dye with - like turmeric! If you've done natural dying before, I'd love to hear about it! Wow. Love this look! Tea towels...Who would've thought?! Love this! 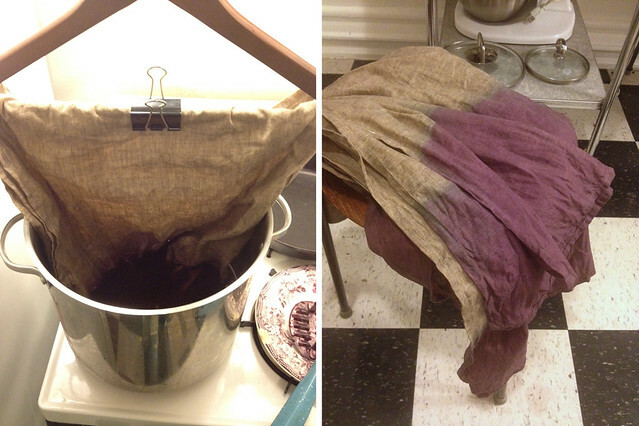 You make this natural dyeing business seem accessible (seems like all the other blog posts on the topic I come across are all about dye pots and mordants and etc. etc....very intimidating!). Your approach seems like a manageable way to start--plus, a beautiful result! A Verb for Keeping Warm on San Pablo in Oakland is a great place to learn about natural dyeing, they even grow many of their own dye materials in their backyard. 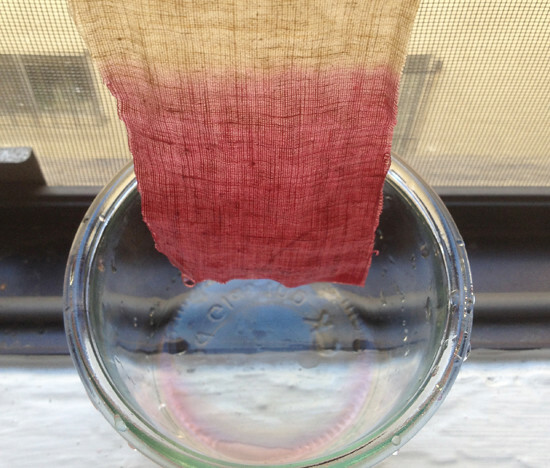 Sarah - this is a fun and easy way to get started with the natural dying, but the results won't last very long as berry dyes are not lightfast and fade fairly quickly over time; they are a stain rather than a dye. thanks, I'm going to make tea towel gifts from an old, taupe, linen comforter cover I am tired of, who doesn't need fresh tea towels?